Fantasizing about the awesome things we want to accomplish in the pool is easy. And let’s be honest, we all do it anyway. Whether it is daydreaming during class or work about how amazing it would feel to achieve the huge things we like to think we are capable of. Take that day-dreaming a step further and not only swim faster at meet time, but improve your performance mid-practice and develop better technique. You’ve probably heard of the concept of mental rehearsal before. You find yourself a quiet corner, close your eyes, and imagine your ideal race. The crispness of your stroke. The way the block feels when you grip it with your hands. How you explode off of the wall. The reason mentally rehearsing your races works so well is that the brain has great difficulty telling the difference between a real and imagined experience. Which means that you can perform a dry-run of your race dozens of times before you ever dive in the water, so that when you do explode into the pool it will feel like you’ve already done it a hundred times. Such is the power of mentally rehearsing. Being mentally prepared for the big meet becomes easier when we visualize the outcome that we want. Imagine a great race. Imagine yourself responding to adversity mid-race (your goggles filling up, not timing a turn perfectly; doing these things in advance, and rehearsing how you will react to it will help you not panic in the event something stinky does happen. Michael Phelps used this technique to great effect in the 2008 Beijing Games. Diving into the water for his 200m butterfly, he experienced every swimmer’s nightmare—his goggles sprung a leak. 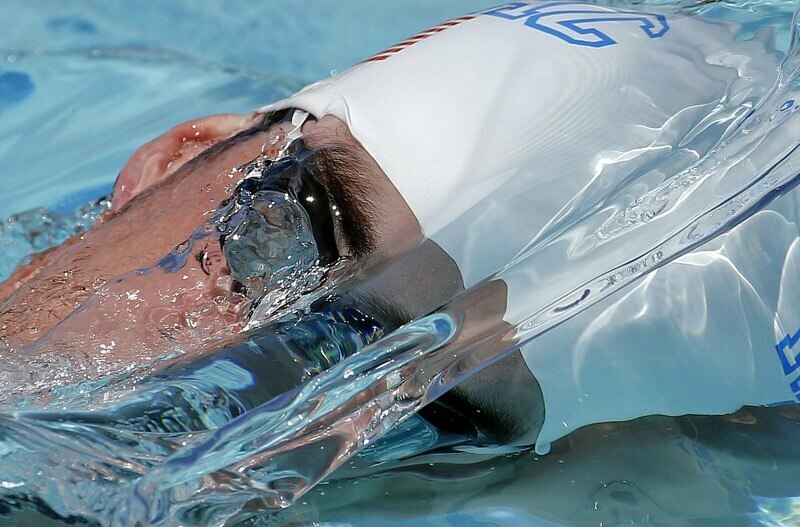 Unable to see a single thing over the course of the final lap Phelps powered his way to not only another gold medal on his way to his historic 8 gold medals, but a world record. Rehearse the process, not just the results. Goals in the pool are important. They inspire us, push us to keep at it when we are exhausted both mentally and physically at the end of a grueling workout. And they help guide our efforts over the course of a long season. But fixating solely on our goals in the water misses a crucial aspect of seeing them through—the process. Researchers at UCLA had two groups of collegiate students visualize their performance on an upcoming midterm. The first group were instructed to focus solely on performing well on the actual midterm, while the second group was told to visualize themselves executing the process of doing well on the midterm. Not only did the second group perform much better on the midterm, but they also exhibited much better study habits, and were more confidant and less anxious about the test. So how do we translate this method of rehearsal to the pool? Showing up to early morning practice. Not giving up when the main set starts to crush you mentally. Doing extra work on your freestyle kick at the end of practice. Finishing the last rep with full power and excellent technique. So now that we have covered the benefits of visualizing our races, and the process with which it will take to accomplish the things we want to accomplish, what is there left to daydream about? Narrowing the focus even further, you can use visualization during practice to boost your performance. Research published in the Journal of Strength and Conditioning Research found that when track athletes were asked to visualize before a quick sprint 87% of them performed better than those who were distracted or didn’t mentally rehearse at all. How can you use this knowledge to swim faster during practice? When you are catching your breath between reps and sets take a few seconds to picture yourself performing at the levels you want to be swimming at. The technique you want. The feeling of the water getting caught on your forearm. The sharp rotation of your shoulders and hips. Instead of spending that time mindlessly hanging on the wall imagine the form and speed you are aiming for. The closer you pair the visualization to the actual effort, the better—visualization was most effective when done 1-2 minutes prior to the sprint. It might sound a little hokey, but the power of visualization has been shown over and over to work for better and faster swimming. The best part is that it takes a shockingly small amount of effort, certainly in proportion to the results that it can yield. All it really requires is the discipline and consistency to do it regularly. Little effort with a high yield in terms of performance?